 Vagnsset med 3 godsvagnar Habbiillnss "Swiss Post AG"
Vagnsset med 3 godsvagnar Habbiillnss "Swiss Post AG"
By buying this product you can collect up to 3020 bonuspoints. Vagnsset med 3 godsvagnar Habbiillnss 'Swiss Post AG', totallängd över buffertar 80,1 cm, epok VI. Model: All of the cars have adjustable buffers and trucks. One each car has a German, French, and Italian advertising design. All of the cars have different car numbers and are individually packaged, with a master package. Length over the buffers per car 26.7 cm / 10-1/2'. DC wheel set E700580. Delivery planned for the 1st quarter of 2018. 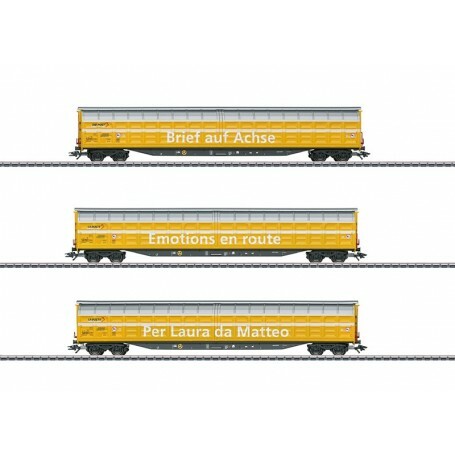 Leasing special freight cars is the business model of the Swiss family-owned firm WASCOSA. The innovative type Habbiillnss sliding wall boxcars for transporting weather-sensitive, high-capacity, palletized freight loads are part of the company's pool of over 7,000 cars. These cars set new standards in terms of functionality and logistics with a load surface of 62.4 square meters / 671.67 square feet, a maximum cargo load of 63.5 metric tons, two or more separation walls that can be moved and locked in place, as well as a maximum speed of 120 km/h / 75 mph.